An important but little-known book takes us a step further in experiencing the ways of Christian prayer. 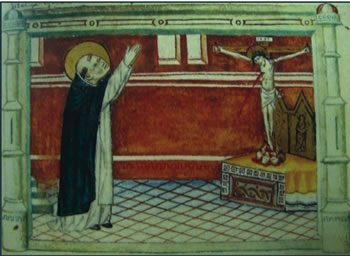 The book relates how St Dominic prayed. Domingo de Guzman (Dominic) was born in 1170 in Caleruega, a small town in the far north of Spain. He lived there for only the first seven years of his life. His parents being wealthy, he was sent to the nearby town of Gumiel where he began his education with his uncle. He joined the Premonstratensian Order and then became a Canon of the Cathedral at Osma. In 1203 and 1205 he went on a diplomatic mission to Denmark. On his return through France he encountered the heretical sect of Albigensians. This encounter brought a shocking realisation to him: that without sound knowledge of the faith, Catholics were easily led astray into heresy. He founded the ‘Order of Preachers’, whose main task was and is to study the faith, to live it, and to hand on to others the fruits of that study and prayer. The Order of Preachers was approved in 1218. Dominic died in 1221, and was canonized in 1234. At the process for Dominic’s canonisation, 36 eye-witnesses were called to give testimony to Dominic’s sanctity. All testified that he was a man of intense prayer. 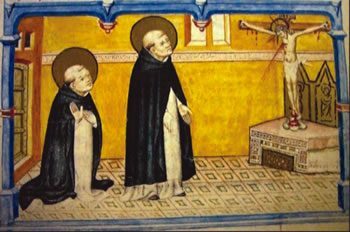 Somewhere between 1260 and 1288, an unknown author gathered the testimonies of these eye-witnesses and wrote an illustrated text called, ‘Quomodo Sanctus Patriarcha Dominicus orabat’, -- ‘How the holy father Dominic used to pray’. This small book, measuring only 17cm x 12.4cm, contains 10 miniatures illustrating the text. The text is one of the shortest in the literature of prayer. It covers only 22 pages of script. It is the only document in existence which actually describes what a person was seen to do when he or she prayed. 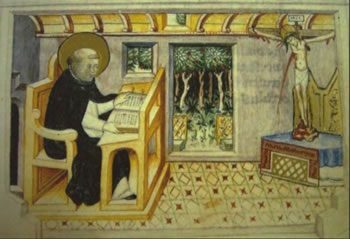 But it is more than a ‘photographic description’ of ways in which St Dominic prayed.In the way the painter uses colour, line, shape, and in how he represents the architecture of the space, these paintings are a description of the interior attitudes of St Dominic. This text also describes how a holy man of prayer used his mind, his heart and his body to pray. We look at the text of this document, the original being kept in the Vatican Library. 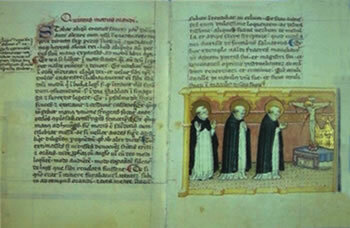 The text with these miniature illustrations is a summary of the original text. 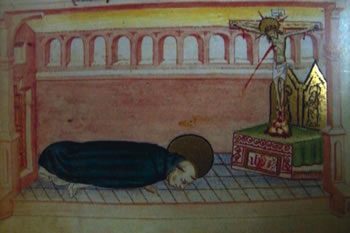 “Saint Dominic’s first way of prayer was to bow down before the altar as if Christ, signified by the altar, were truly and personally present. “In this way our holy father, standing erect, bowed his head, and then gave himself completely in showing this veneration. “The brothers were taught to do this whenever they passed before the Cross. 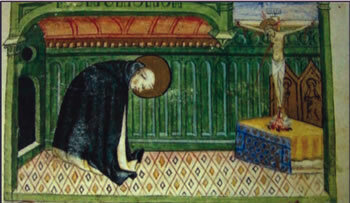 “Saint Dominic used to pray by throwing himself outstretched on the ground, lying on his face. “Then he would weep and groan vehemently. “This is why the Order decreed that all the brothers should receive the discipline with wooden switches upon their shoulders as they recited the psalm ‘Miserere’. 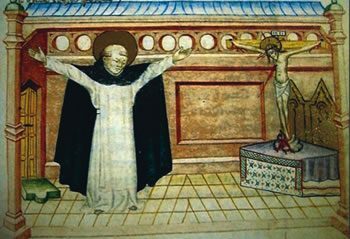 “After this Saint Dominic would remain before the altar or in the chapter room with his gaze fixed on the Crucified One, looking upon Him with perfect attention. “He genuflected frequently, again and again. “He was in a stage of longing and anticipation like a thirsty man who has reached a spring, and like a traveler who is at last approaching his homeland. 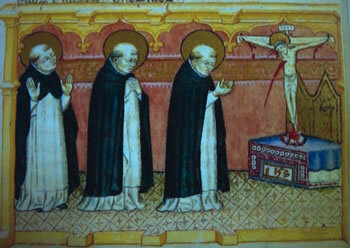 “Sometimes our holy father Dominic would remain in front of the altar, standing upright without leaning on anything. “Often his hands would be extended before his breast in the manner of an open book. He appeared to be reading. “He would sometimes join his hands, clasping them firmly together. 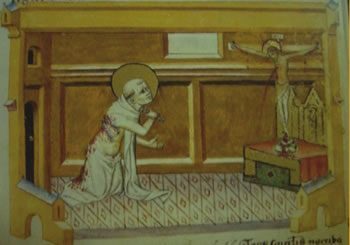 “Our holy father Saint Dominic was also seen to pray standing upright with his hands and arms outstretched in the form of a cross. “In a solemn manner he would slowly pronounce the words in the Psalter which mention this way of prayer. He used to say attentively, “O Lord, I invoke you all day; I stretch out my hands to you” (Psalm 88:9). “While praying he was often seen to reach towards heaven like an arrow which has been shot from a taut bow straight upwards into the sky. “He would stand with hands outstretched above his head and joined together, or at times slightly separated as if about to receive something from heaven. “One would believe that he was receiving an increase of grace and in this rapture of spirit was asking God for the gifts of the Holy Spirit for the Order he had founded. 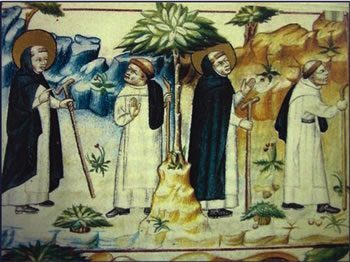 “Our father, Saint Dominic, had yet another manner of praying at once beautiful, devout and pleasing, which he practiced after the canonical hours and the thanksgiving after meals. “Our father would withdraw to some solitary place, to his cell or elsewhere. He would sit quietly, and after the sign of the cross, would begin to read from a book opened before him. It seemed as if he were saying, “I will hear what the Lord God has to say” (Psalm 84:9). “When he read alone in this fashion, he would venerate the book, bow to it, and kiss it. “Our father Saint Dominic observed this way of praying when travelling from one place to another. On these journeys he delighted in giving himself completely to meditation, disposing for contemplation. “Parting from his companion, he would go on ahead, or, more frequently, follow at some distance. “Thus withdrawn, he would walk and pray; in his meditation he was inflamed, and the fire of charity was enkindled. “While he prayed, it appeared as if he were brushing dust or bothersome flies from his face when he repeatedly fortified himself with the Sign of the Cross.